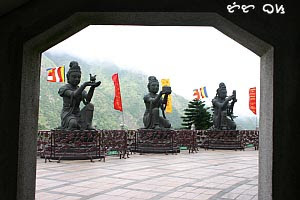 Lantau Island hosts not only the Hong Kong International Airport, the carefully Feng Shui-planned Disneyland, and Citygate Outlets but also the tourism village of Ngong Ping, featuring the Tian Tan Buddha, popularly known as Giant Buddha, the Po Lin Monastery, The Wisdom Path, Tung Chung Fort and Lantau Peak. 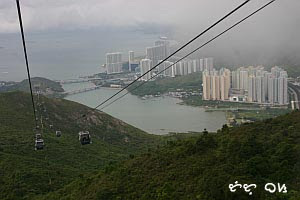 Tutubi hopped into a gondola of Ngong Ping Skyrail, an almost 4 mile long cable car, formerly called the Tung Chung cablecar that ferried the flightless Tutubi from Tung Chung to the village of Ngong Ping on the plateau. Ngong Ping Village consists of coffee shops (touristy Starbucks included), restaurants, and souvenir shops. 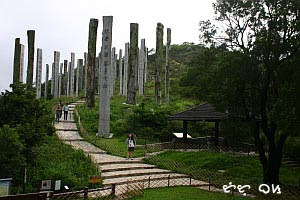 "Ngong Ping Village is set on a 1.5 hectare site on Lantau Island, adjacent to Ngong Ping Skyrail's Ngong Ping Terminal and the Tian Tan Buddha Statue. This amazing cultural themed village has been architecturally designed and landscaped to reflect the cultural and spiritual integrity of the Ngong Ping area. It boasts several major attractions - Walking with Buddha, Monkey's Tale Theatre and the Ngong Ping Tea House - as well as a diverse array of retail, dining and entertainment experiences. Walking with Buddha is an immersive, multimedia attraction allowing guests to follow the life of Siddhartha Gautama - the man who became Buddha - and his path to enlightenment. 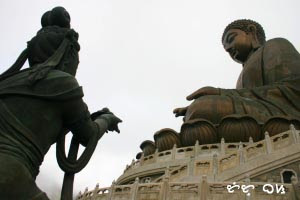 Here you will discover the origins of Buddhism and track its expansion across the globe. You will also be enlightened as to the essence of Buddha's teachings through a variety of themed scenes and activities." A giant arch welcomes all visitors to Po Lin Monastery (寶蓮禪寺, Literally "Precious Lotus Zen Temple) founded in 1906 with various images of Buddha and scripts on display. 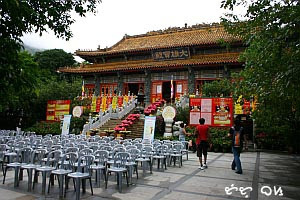 It is here at Po Lin where the Buddha Bathing Festival is celebrated annually by bathing ritual performed even by visitors during Buddha's birthday in May. 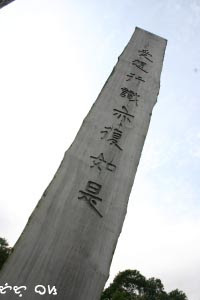 Nearby Po Lin is a trail that leads to the Wisdom Path, where the Mahayana Buddhism's Heart Sutra is inscribed on wooden poles. The poles are arranged seemingly in a figure of eight or Mobius strip to signify infinity. 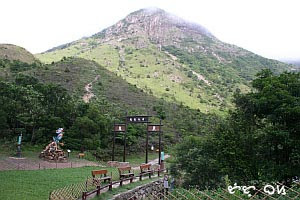 the path goes uphill up to Lantau Peak, the second highest peak in Hong Kong, great for mountaineers and trekkers, and the ancient Tung Chung Fort. Tutubi didn't trek all the way up to the Peak due to an imminent rain threatening to fall. 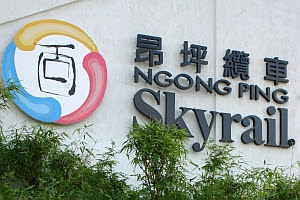 Ngong Ping Skyrail is slower than the Genting Skyway cablecar in Malaysia, and not recommended for the faint-hearted. Note: The cable system is currently suspended indefinitely due to a recent incident where an empty gondola fell. Commute via MTR: take the Tsuen Wan line and alight at Tung Chung, the end of the railway in Lantau then get your tickets for the Ngong Ping Skyrail. Alternatively, you may board a ferry at Central to Mui Wo (Sivermine Bay) and take the #2 bus to take you there. 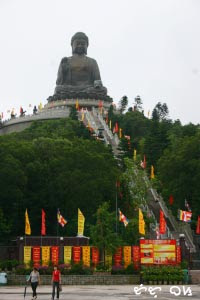 Access to Ngong Ping village is free (no entrance fee). For other pricing and packages, click here for the official prices. Ngong Ping looked like a nice and serene place to visit. my husband loves this place. i wish i could go someday. You saw it all! Now I need to go back to HK and look it up for myself! sidney, not actually all. i skipped others. i have 2 more posts about Hong Kong before I return to the Philippines. btw, street photography is hard in HK, people are not used to smiling and get angry if you try to take pictures of them. a cultural thing, I guess. The Bhudda statue is really enormous...It should be a sight to be visited for any serious tourist on this side of the globe. Wow!!! This is a really nice place to visit...that is if ever I happen to be on that side of the globe. Wow, this really looks like a unique site! Wow. These are great pics! I always feel so educated when I come to your blog!! wow this is my first time to see a huge image of buddha. Do people have to climb the hill by feet or is there any escalators available going up? Hi! Me and my family are going to HongKong next week during the sembreak. I'm researchig on the places that we should visit and your blog has given a lot of awesome info. Thanks! I'm interested in visiting Ngong Ping but I'm worried that the guided tour mentioned in their website might be a rip off. 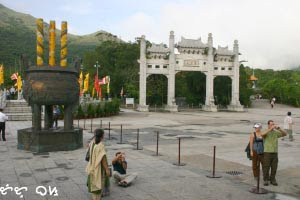 Is it easy to go around Ngong Ping even without a tour guide? And can you also give more info on commuting around Hong Kong? Thanks! i have many Hong kong posts here if you found them all. 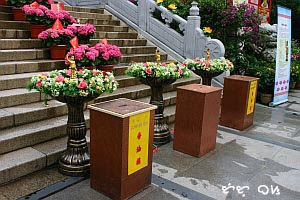 i'm thinking of doing a hong kong travel tips post similat to what i did for my singpore series. commuting in HK is easy, at the airport get hold of all those brochures and maps then buy octopus cards. the trains called MTR are very efficient, while buses, have adesignated routes. the trams on HK island are the cheapest. Thanks Tutubi! I love your blog kasi it's not the typical travel blog na walang mashadong sense. I specially liked that you looked for Rizal's former clinic. I think that's really cool! 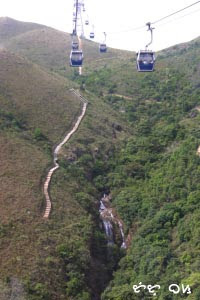 I have one last question though, How long would it take us to go around ngong ping? Do we really have to alot an entire day for it? Sorry, I have lots of questions, I'm just really excited about going.